With all our work, Colour Enhancement is standard. We aim for the best results possible so producing a film conversion to the highest standard can be guaranteed with all our work. The process of capture is quite simple as the reels are played very slowly and digitally captured. This process eliminates any tears or snaps to the film and the best results are achieved by doing this, also at a very low temperature, stopping any further light damage to the film. Once this is complete, the digital image is handed over to our computer technicians for clean-up and enhancement. Frame by frame the film is viewed, cleaned and touched up where needed. Editing out any marks, joins and piecing together. After this process, its over to our music lab where we add ambiance back ground music to suit the era and theme of the recording. Then an introduction and menu’s are created to give that “block buster” feel to your movie. Your movie will then be viewed by our quality control and then your DVD will be ready to be returned along with all your originals, by recorded courier. 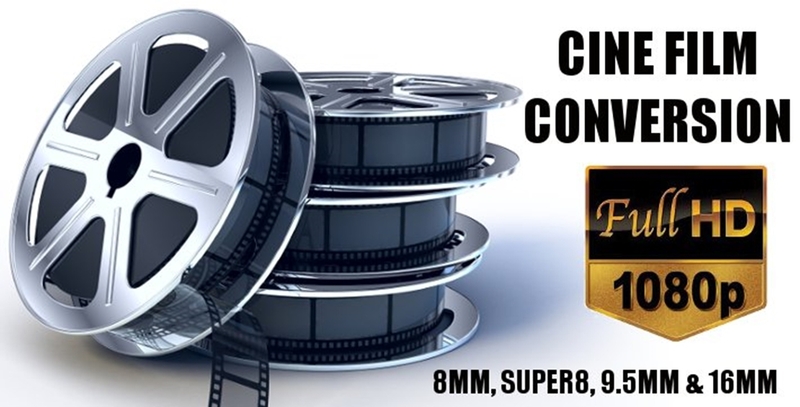 Our Cine conversions start from as little as £29.99 which Includes 4 copies of your finished movie. "i want to thank you for doing my grandfathers film , you gave me something my family will never forget .. great job and fast as well.. thanks again"